Classic Elite Yarns: Allegoro Staff Projects! Our webletter this week gives you a little sneak peek into our homes and lives with some original designs by Classic Elite staffers! It was interesting to talk to everyone about what inspired their designs. Andi's beautiful napkin edging is a tribute to her grandmother and a harkening to a more genteel time, when tables were set with true linens and many women created beautiful things for their homes by hand. The elegance of Tonia's napkin belies its origin: fun! 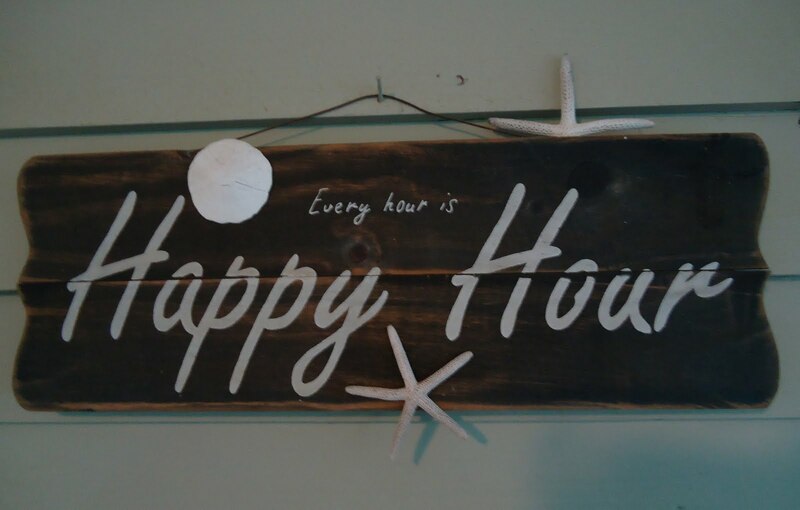 At her home, summer meals are enjoyed al fresco in her beach-inspired screened porch, I love her family motto, printed eloquently on the sign below. The napkin would also be perfect for picnics, where it's key to minimize waste and your environmental impact on our city's green spaces. Susan's lovely faux-mitered table squares add the perfect accent to a summer table, as photographed under a mason jar filled with flowers from the garden. Lastly, Meg, who had a little uninvited guest at her home, got hooked on antiseptic wipes and felt a giant plastic canister didn't quite complement her decor. Thus, a not-always-pleasant reality of urban living was her inspiration. I love the idea of Andi's napkin edging being used as a delicate border for a simple A-line skirt or summer camisole, either sewn directly to the edging or demurely peeking out from under the hem. A Google search yielded several tutorials for adapting old tee shirts to camisoles, and I think this edging in a contrasting color would be perfect! 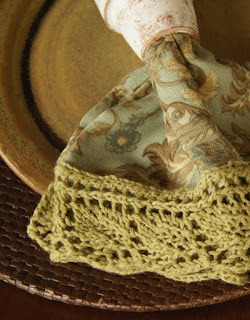 Tonia's napkin would make the perfect knitting needle roll for DPN's or single point needles! 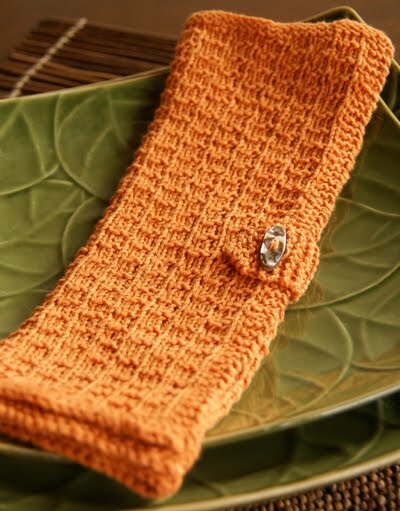 Simply knit the piece long enough and cut 2 pieces of fabric the same width but long enough to fold in on the bottom. Sew them together with right sides facing, making sure to leave a small bit unsewn on the bottom edge to turn it right side out. Topstitch along the bottom and fold the bottom up and topstitch along the sides. Then stitch some lines on the now turned-up bottom to separate the needles. Finally, and this is the hard part for me, handsew the fabric piece to the knitted piece and voila! I love the unexpected juxtaposition of the elegant stitch pattern with a modern, ultra-bright print. Susan's table square can be made into a smart little head kerchief by measuring your head from ear to ear and simply stopping halfway through when the piece is still triangular and large enough to cover your head. Sew some funky ribbon to both sides and wear away! No sewing is required for Meg's adaptation. The stitch pattern and ladylike ruffle lend themselves perfectly to a pair of fall gauntlets to warm up your wrists when your coat sleeves simply aren't long enough. 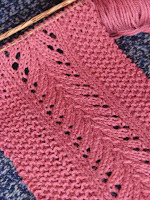 Measure your forearm where you would like them to begin and cast on enough repeats to go around. Then work the pattern until just past your wrist and then work the ruffle! If you're feeling very bold, switch to working them flat instead of in the round right where your thumb is, and then rejoin after a few rows to create a thumbhole. We would love to know how you would use these patterns! In fact, we're so eager to hear about your projects that we're having a giveaway! Between today and next Tuesday, August 3rd, comment on this post with your ideas. We will random select one commenter to receive an Allegoro scarf kit! The kit includes 100 grams of Allegoro and the pattern pictured to the right. Please be sure to include some sort of contact information, either an email address, Rav user name, what have you.We look forward to meeting you! 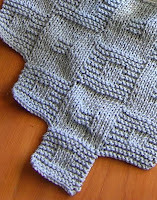 I'd love to add the edging to a soft piece of flannelette for a cozy baby receiving blanket. If Allegoro is good for lace, it must be good for me. I'd love to try it! 19hero2I am going to try the napkin edging on a flannel baby blanket. Excellent blog-- gorgeous projects-- distinctive voice-- interesting tales-- well done! I love projects that I can use on a daily basis. The hand wipes cover would look great in my car. Being the only female in the family, I look for opportunities to "girly-up" the Prius! Thanks! That scarf pattern is so lovely! The lace would be wonderful for the straight dress or skirt that shrinks a bit when washed. Purchased lace doesn't allow the color choices or the proper weight. Heck, it might be worth shrinking a skirt to be able to have an excuse to add this..
Every one of these projects is a winner! Although not a garment, I could see the antiseptic wipe cover being used as a flower vase cover as well. The lattice-like design would complement the flowers, especially "climbing" flowers or ivy. That edging would work on my cut off jean shorts - something simple and elegant, with a leaf. 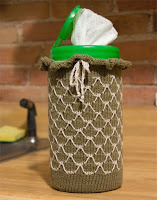 Or the canister cozy would make a good water bottle holder with a strap added. Looking at the lace edging I immediately thought of how beautiful it would look on a set of pillow cases and what a wonderful gift for a Bride-to-be to have a set of bed sheets with this beautiful lace edging. The lace edging would be a distinctive touch on cafe curtains, and if that's too much, just adding them to the tie-backs would be a touch of elegance. I am working on edgings for pillowcases to give grandchildren. My grandmother made crocheted, lace-edged pillow cases for me; my mother-in-law made embroidered cases for my children; now it is my turn to knit lace for the my grandbabies (6 sets!). I like the leaf edging shown on the napkins. I have been using an antique Canadian design, but would like to try this for a change! Cotton and linen is a winner too - washable and practical, but elegant and suitable for heirloom work. I love wearing scarves, but usually they're so big that I'm swimming in them (I'm 5'1) or they're way too much fabric to wear in the summer. 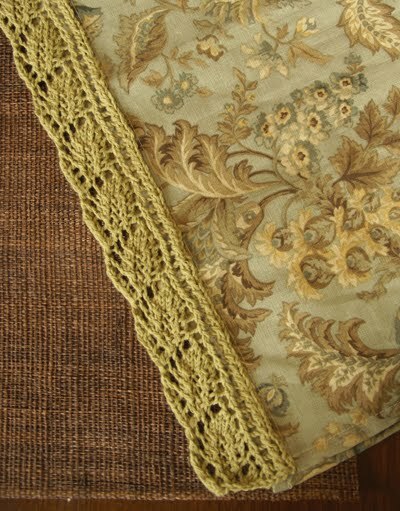 I'd use the lace to edge a simple length of linen fabric to make my own weather-appropriate, short-person-friendly scarf. I think a great use for the antiseptic wipe cover pattern would be as a bolster pillow. That edging would be perfect on the edge of a shelf or shelves. Such a perfect touch for decorating. I'd like to try the Allegoro for just that purpose. The blog is great to read. Thanks! So glad you guys have started a blog! CEY is one of my favorite yarn manufacturers. I'm sparkeespud on Ravelry. As a big fan of modifying existing garments with new knit or crocheted details, that lace napkin edging to me presents numerous possibilities. It would make an interesting embellishment on the cap sleeve of a tee for a little added arm coverage. Or extend the life of a sweater whose existing cuffs have worn out. I tend to wear my favorite sweaters til their last gasp, and sometimes darning is just not enough to keep the cuffs looking presentable. Or it might look nice lining the opening of a swingy cardigan made from a boring pullover. I love the idea of adding a knitted lace edging to a woven piece of fabric! 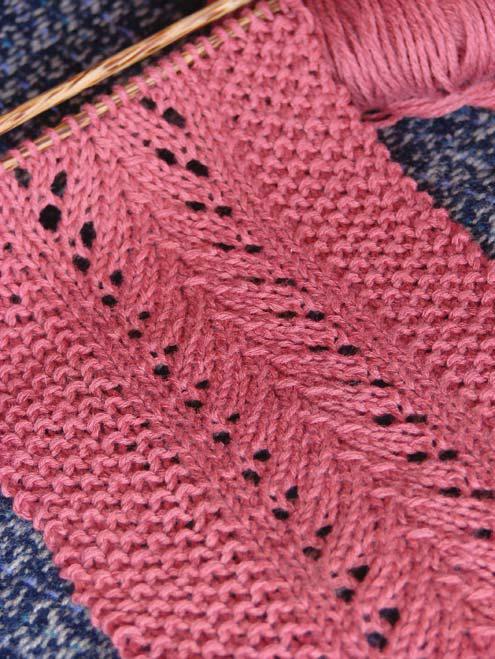 While I have neither the time, budget, or fortitude to create an entire blanket or lace curtain, adding just a touch of knitted lace to a larger project makes it personal and special. Several have mentioned using the leaf edging on bedding which would be beautiful, but I see the leaf edging on throw pillows on the sofa. I live on the beach so the colors of soft greens and blues would work. Actually I'll change the leaves to waves! Thanks for the inspiration! ohhh! i love the colors in the napkin in the first picture. i read that you have a blog on knittyblog, so i just hopped over here. The edging is quite lovely. Several ways to apply that idea come to mind immediately: on curtains, on a top or along the bottom of a skirt, on a breadbasket liner or even a tablecloth (for the ambitious). Meg's antiseptic wipes container cozy really caught my attention! I'm planning on making several in coordinating primary colors (red/yellow/green, perhaps) to cover the large condiment squeeze bottles of catsup, mustard, and relish that accompany us on lakeside picnics and all too often slip out of our hands due to water or sunscreen. Come fall, a pair of those with an open bottom would be great for a totally different purpose: To cover the gap between end of coat sleeve and top of glove cuff. Needless to say, I'd love to win the scarf kit to make and wear then too! I would love to add this edge to a floral skirt I own. It would give it weight and a touch of finesse. (also lengthen it, I am tall and most skirts are too short)..hmm.....ideas are brewing!!!! Looks great. How about the edging on window curtains? I would use Tonia's napking edging on a v neck tee shirt, by adding the edging around the neckline and on the bottom of the sleves, it would be very elegant. I think Meg's canister holder would make a great little project bag to take along a small project. I would simply add an icord handle, or maybe a braided handle, and line it with satin so that the yarn inside will not get marred. Susan's table cover would make a really cute wrap, you could easily change the size and shape to whatever size you need/want. I am thinking that napkin edging would look beautiful around the neck of an old tshirt. 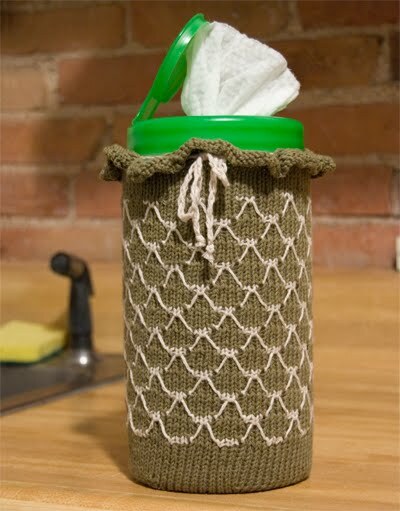 I also love the idea of a coffee sleeve made using the ruffled pattern from the wipes cosy. The napkin edging is perfect for a scarf I'm making and trying to figure out how to finish off. I can so see the edging as the hem and straps of a cotton sundress! When I first saw the wipe cover, I misread it as "Wine cover." Tells you were my mind is. LOL But really, it would make a nice cover for a bottle of wine to keep any drips from pouring from reaching the tablecloth. I like Susan's pattern for placemats--convert the shape to a rectangle, and they'd be lovely mats on my mother's dining table. I love the knitted edging. I think it would look pretty on the hem of a camisole for my daughter. I would love to knit the scarf as well, what an interesting design.